In the European Union’s fourth-largest country, amid mass poverty and unemployment and growing popular disaffection with the centre-left parties and their pseudo-left apologists, Sunday’s parliamentary election in Italy resulted in a historic defeat for the governing Democratic Party (PD) and a victory for the right-wing and extreme-right parties. Italy’s desperate levels of social distress—with youth unemployment at 30 percent—are largely the product of policies pursued by centre-left governments. While right-wing governments under Silvio Berlusconi were characterised by unrestrained corruption, the names of the centre-left prime ministers—Romano Prodi, Massimo D’Alema and Matteo Renzi—are inseparably linked to social cuts and austerity directed against the working class. The main beneficiaries of Sunday’s election were right-wing and far-right forces—above all, Beppe Grillo’s Five Star Movement and the racist Lega led by Matteo Salvini. At 73 percent, voter participation was relatively low by Italian standards. The right-wing parties’ electoral victory has deepened the crisis of the European Union because the Five Star Movement and Lega are either critical or oppose Italy’s membership in the EU. Financial observers also fear that an extended government crisis could lead to the collapse of Italy’s fragile banking system. No party or electoral alliance secured the majority required to govern. The PD, the former governing party, won just 18.7 percent of the vote. It now holds only 105 of 630 seats in the Chamber of Deputies and 50 of 315 seats in the Senate. Free and Equal (LeU—Liberi e Uguali), a split-off from the PD led by anti-mafia state prosecutor Pietro Grasso, won just 3.4 percent of the vote. Matteo Renzi declared his resignation as PD leader Monday evening. The alliance he led, which included a group around Giuseppe Pisapia (Insieme) and the pro-EU +Europa, won just 22.9 percent of the vote and came in third place behind Berlusconi’s right-wing alliance and Grillo’s Five Star Movement. Matteo Salvini, leader of the Lega (formerly Lega Nord), asserted his claim to the post of prime minister on Monday. His party has “the right and the duty to govern in the years to come,” said Salvini. With 17.4 percent of the vote, Lega outperformed its alliance partner Forza Italia (14.0 percent), led by Silvio Berlusconi. The fascist Fratelli d’Italia (Brothers of Italy) of Georgia Meloni, which is also part of the alliance, won 4.3 percent. With a total of 37 percent of the vote, this alliance emerged as the largest. Berlusconi announced his intention to appoint his party colleague Antonio Tajani as prime minister. Due to a conviction for tax avoidance, Berlusconi is no longer allowed to hold public office. Instead, Salvini could become prime minister. After Hungary’s Viktor Orban, Austria’s Sebastian Kurz and the Czech Republic’s Andrej Babis, this would result in another notorious racist and xenophobe becoming head of government in the EU. The Lega Nord emerged in the 1990s and campaigned for the separation of the richer northern parts of Italy, “Padania” in the Lega Nord’s propaganda, from the poorer south. Even then the party conducted virulently xenophobic campaigns. Under Salvini, the party expanded nationwide and adopted an anti-EU, far-right and racist programme modelled on Marine le Pen’s National Front in France. However, the right-wing alliance will not be able to form a government without another coalition partner. It is also possible that the alliance will fall apart. One option discussed prior to the election has been ruled out: a “grand coalition” of the PD and Berlusconi’s Forza Italia. The two parties, which have taken turns at the head of successive governments since the early 1990s, no longer even have a third of the vote between them. Along with Salvini, Luigi de Maio, the lead candidate for the Five Star Movement, has also claimed the position of prime minister. With 32.7 percent of the vote, the Five Star Movement emerged as the strongest party and the winner of the election. It gained support in the impoverished South in particular. A map of Italy, divided according to the party that won in each region, reveals a new kind of division: in the north the blue of the right-wing alliance can be seen everywhere, with two exceptions, Tuscany and South Tyrol, where the Democrats still have a base of support. But in the South and Southeast there is only one winner: the Five Star Movement, which won 49 percent of the vote in Campania, 48 percent in Sicily, 44 percent in Apulia, 43 percent in Calabria and the Basilicata, and 42 percent in Sardinia. The M5S will control more than a third of the seats in parliament, with 225 of 630 in the Chamber of Deputies and over 100 in the 315-seat Senate. 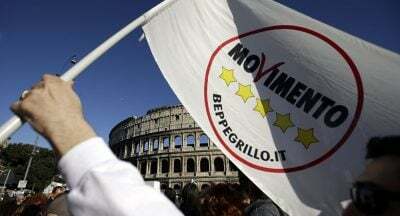 The Five Star Movement exploited the fact that it has yet to join a government in Rome, and benefited above all from widespread dissatisfaction with the other parties. M5S, which pursues a hard-right course on refugee policy and the selection of its international allies, claims to be a party that is “neither left nor right.” M5S did well among young voters, who have only experienced governments led by the PD and Forza Italia while unemployment has destroyed entire regions and forced many young people to emigrate. The 31-year-old de Maio attempted during the election campaign to present M5S as ready for government. He spoke in front of top businessmen and investors and downplayed his party’s traditional anti-EU stance. The party also eliminated a passage from its programme banning the formation of coalitions with other parties. “It is time to enter government,” stated de Maio. His party would not “leave Italy in chaos,” but would hold consultations with all political forces. In the EU, the media and on financial markets, the Italian election result triggered unrest. On the same day that a decision in favour of a continuation of the Merkel government in Germany was finalised after more than five months, a new crisis broke out—in Italy. Future developments are largely in the hands of President Sergio Materella, a 76-year-old jurist and PD politician. He is holding back-room talks with the political parties and will task one with forming the government, which, if successful, will have to secure Materella’s approval of the cabinet before it is voted on by parliament. An initial indication is expected on March 23, when parliament’s two chambers meet for the first time and elect their presidents. The Italian election outcome is the result of the deep-going dissatisfaction among the population with all previous governments. The dominant feelings are anger and disappointment with parties that call themselves left but carry out the bidding of the banks and major corporations. In Italy, Matteo Renzi and Paolo Gentiloni have imposed the dictates of the banks and corporations with the assistance of the Jobs Act labour market reform, the slashing of anti-poverty programs for the elderly and social spending cuts. They actively participated in NATO’s military build-up and the militarisation of the EU, and backed the war threats against Russia. In Libya, a former Italian colony, Foreign Minister Marco Minniti (PD) concluded a pact with the Libyan coastguard to block refugees from crossing the Mediterranean. The PD’s electoral debacle is due above all to this right-wing, anti-worker record. Given the absence of a progressive and socialist alternative, right-wing parties were able to profit in the election. The electoral alliance Potere al Popolo (Power to the People, PaP), secured just 1 percent of the vote. Having served as a fig leaf for right-wing governments for years, the pseudo-left is no longer capable of presenting itself as an alternative. Its role models include Alexis Tsipras of Syriza, who as Greek prime minister has imposed a vicious austerity programme. Rifondazione Comunista, the chief political force behind PaP, was a member of Romano Prodi’s government from 2006 to 2008, which laid the groundwork for the current policies of war and social austerity. Immediately thereafter, the rise of the Five Star Movement began.